Mark Meshulam is an expert witness and consultant for window preservation. In a continuation of our 20 year retrospective of our unique historic window replacement at Chicago’s Field Museum of Natural History, we have dusted off never before seen video of the design and testing of the project, jazzed it up with some editing and have posted it here for your edificial edification. Historic window renovation is a special corner of the window business, and it is one of my favorites. It requires a level of field surveying that is beyond the level required by typical window replacement. It might involve the stabilization and restoration of existing materials, it might involve replicating certain components, it might involve retrofitting energy efficient properties to the existing system. Historic window renovation might even involve complete window replacement, as is the case at the Field Museum. Whatever the scenario, historic window renovation requires a full understanding of the original Architectural intent and actual in-place construction. In order to accomplish a faithful replacement of components or entire assemblies, one must capture all dimensions and profiles of the original installation. Done well, the details of the visible components of the replaced components will read nearly identical in shape and dimension to the details of the original condition. Historical purists, as well as the U.S. Department of the Interior demand that, if existing materials can’t be repaired and restored, that these elements be replaced with “like kind” material. Wood for wood, steel for steel, you get the idea. This philosophy can sometimes be difficult to reconcile with other building design requirements, particularly specifications for enhanced thermal performance, reduced air infiltration, increased water test pressures, acoustical attenuation, finish longevity, and of course cost. My own philosophy? These days I am happy to get work, regardless of scope. Whatever the project requires, our company has the technical capabilities to do the work. When original ornamentation is present, it’s a shame to miss the opportunity to refurbish that ornamentation to its original glory. There is value in restoring original materials, and challenges involved with adding new features and benefits to an original historic core. The part of the historic window renovation philosophy that bothers me is the aspect of longevity. As we can see at the Field Museum 20 years later, the windows and castings look every bit as good today as they did 20 years ago, with absolutely no maintenance or refinishing. I daresay that the same could not be said if we had used wood. Not only would wood have required repainting by now, but with each successive painting, the finish would lose some of its pristine look. Wood’s difficulty enduring the rigors of time and weather can become a liability when used with insulated glass, which requires a positive seal and a drained glass cavity. Wood also expands and contracts with changes in humidity. This can disrupt seals and make the engineering of gaskets difficult. Imagine this design conundrum: Wood shrinks radially and tangentially (both directions affect wood thickness) in low humidity. Winters tend to be dry. Winter is when you need tight gaskets in order to reduce energy loss. With gaskets mounted between wood elements, such as between sash and frame, the gaskets will be compressed LESS in the winter. 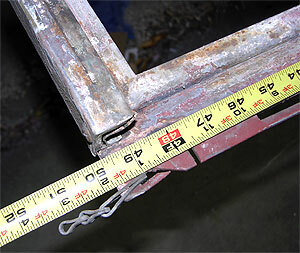 Speaking of gaskets, wood and steel windows have severe limitations with regard to positively capturing a gasket. Aluminum has the ability to be designed with “gasket raceways” which are extruded especially to hold a gasket in a precise operating position. Aluminum can be extruded or formed so that it is nearly identical in shape to the original wood or steel windows. If it is nearly identical, and lasts so much longer, why not use it? When a person looks at a window, they don’t know that material it is made from unless they start knocking. Want to talk about historic window renovation?